I stumbled on the scuffed and worn pages of a vintage magazine in a doctor’s office— warm and grainy photos of landscapes, wildlife, ranching and skiing capture Jackson Hole’s wilderness, history, heritage, the winter bum lifestyle, the battle for public lands and the rising cost of housing. As the story relays the area’s past, it’s striking how long it stayed isolated from settlers and how little land has been surveyed. Today, Jackson’s wild character is as stunning as it was in 1976. Rugged terrain, bitter cold and the limit of human range still impact exploration. 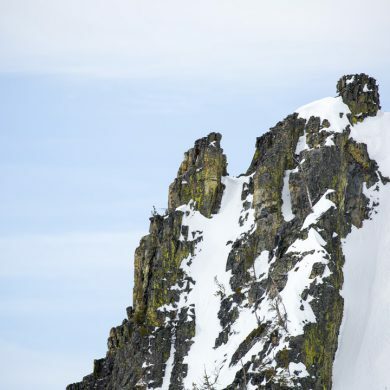 The Tetons are full of tight forests, pinched gullies and cascading ridgelines. 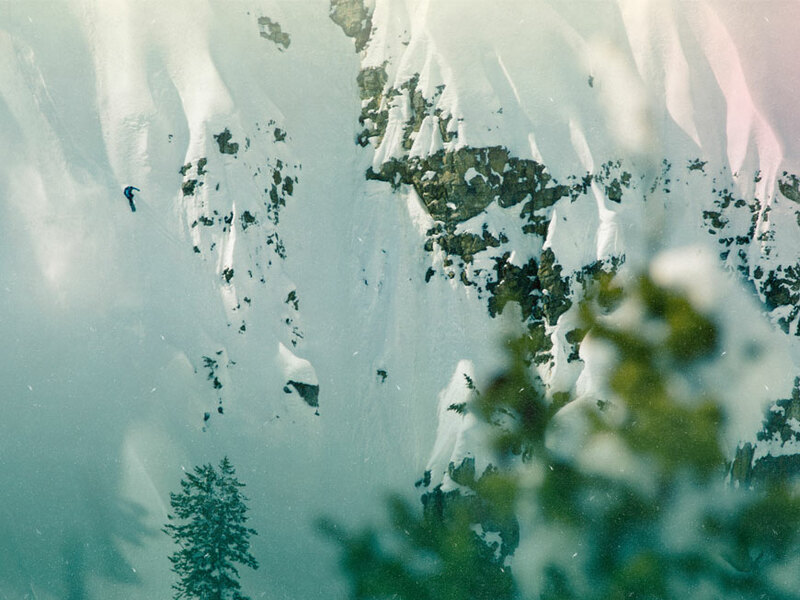 In an area that’s seen 50 years of skiing and riding, the term “first descent” is a bold claim. But when someone like Bryan Iguchi, (a.k.a. 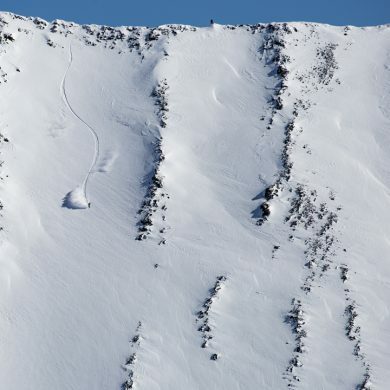 Guch), says the lines ahead are likely a first descent, it’s hard to argue. 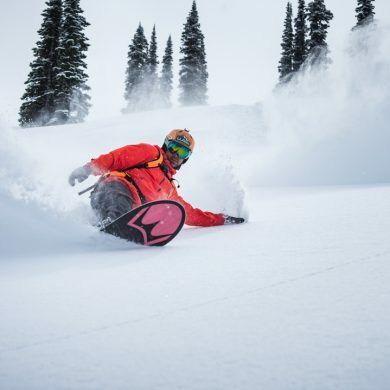 After all, Guch has spent more than 20 years as a professional rider in Jackson Hole. I solemnly nodded and we tore off into the forest and began bashing our bodies and fuel-blasting machines through a thick boulder field. The snow was firm and icy and Gibeau lost traction on a climb. In a matter of seconds, he and his 500-pound sled were on a downhill luge course, catching the track at the bottom, like catching an edge and taking a violent slam. Gibeau shook off the fall and we pushed up a few more challenging boulder-ridden hill climbs and a small gully rally before working into the alpine. The snow was soft but firm with pockets of powder on north aspects. We continued the tour into the unknown, peering across ridges and below into a sea of mountains few if any have ever visited via snowcraft. We snaked down a gully and found ourselves at a headwater of flats with numerous chutes, hips and tubes pouring into a white open expanse. There were no tracks, no landmarks, no signs of human presence. We were close to familiar territory and yet far away. The rough snow conditions at low elevation offered little to ride, but plenty to immerse one’s eye and wonders in all around. 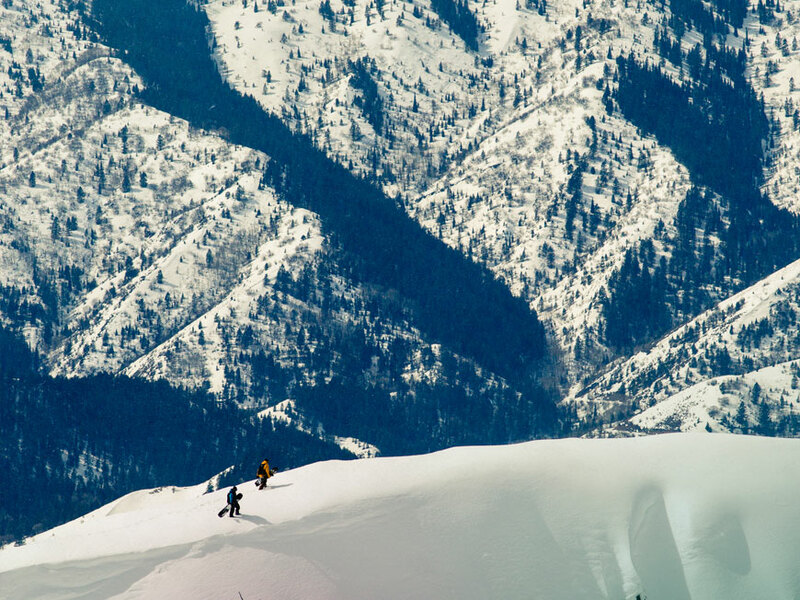 It’s this feeling that all of us yearn for, peering at scenes of untouched snow and mountains. The sense of adventure is what brought Guch here from California more than 20 years ago, and Carter from rural Wyoming, and Gibeau and I from Colorado. We re-traced our tracks back up to a ridge and took a break. It was warm and hazy with a gray glow cast over the peaks. Smoke from Guch’s cigarette blurred into the sky. Tension and calm tied together. Mediocre for riding, the snow was a perfect mix of soft and condensed “go-anywhere” snow to travel by two-stroke paddle track. It was the last day of sun and the last time we could all convene for a while. So we kept searching. We aimed for a higher ridge only a few hundred feet behind us. Guch was two-thirds the way up when a sudden blast overtook the two-stroke engine. His snowmobile belt exploded and he came to a dead stop perched on the slope. Bucked but OK, Guch swapped the belt mid-mountain and returned to the bottom. 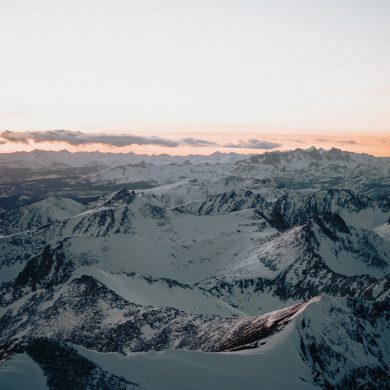 We each rallied up the face, and came to a dead stop at the top of the knife ridge with just enough room to park our sleds and peer across at a face of fluted lines two ridges away. 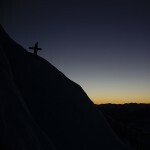 These were the lines Guch had seen before; he’d peered at them during the filming of Travis Rice’s The Fourth Phase. 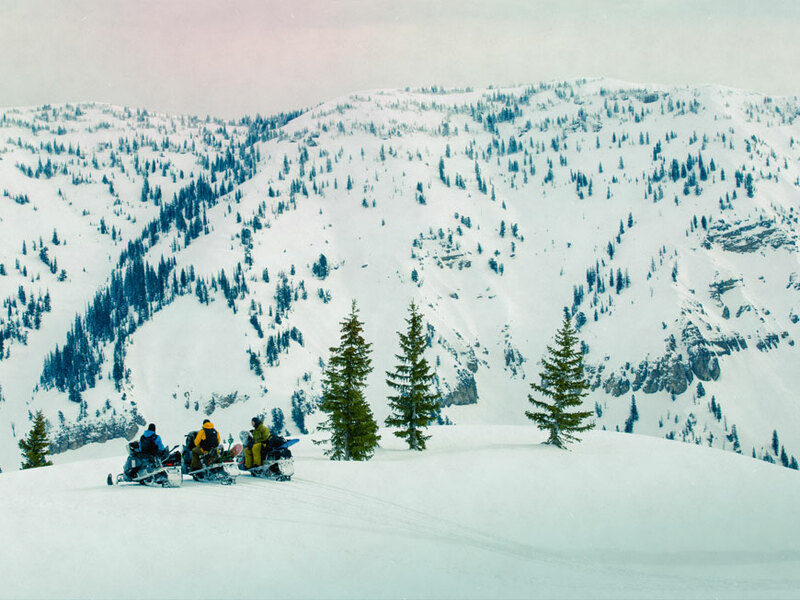 It’d be another hour of sledding, weaving hill climbs through trees, and trying to bust over to the basin below the lines before we were close enough to ride them. There was no easy way in but there was a long hill climb pull up to a tight ridgeline that could put us in range. Soon all four of us were at the top and within walking distance of the face. Guch and Carter plunged boot after boot into the fresh snow as they made their way along the cathedral’s south ridge. As the sound of their steps faded away, Gibeau and I gazed along the horizon where serrated ridgelines cut the sky in all directions. Two bald eagles swooped and soared, vying for airspace high aloft the peaks. We watched the afternoon burn away as Carter and Guch became two dots on a white floor with an ocean of pine forest behind them. Then they dropped. Each took a few hacks, swipes and slices down the face and in a matter of seconds they were sitting at the bottom of the basin, peering back up at the tiny marks they had made on a medium destined to melt away.